A former beggar broke a court order when he failed to keep an appointment with his probation officer. Stephen Ferris, 49, of Princess Street, Blackpool, pleaded guilty to breaching a suspended prison sentence. He was fined £20 but Bmagistrates said he could remain in the court precinct until 1.30pm in lieu of paying the fine. Ferris had previously been put on a Criminal Behaviour Order after committing begging offences in Blackpool town centre. Cheryl Crawford, prosecuting for the probation service, said Ferris was sentenced to four weeks imprisonment suspended for 12 months with up to 20 days rehabilitation to be supervised by the probation service for breaching the Criminal Behaviour Order on January 9. He was told to go to an appointment with his probation officer on January 21 but failed to do so. Steven Townley, defending, said six months ago his client had been at death’s door and been told by doctors if he did not stop drinking it would kill him. Ferris had also had drug problems with Spice, having been introduced to that drug while he was in prison, and also to heroin. He had worked with a number of specialist rehabilitation organisations and was now entirely drink and street drug free. He was also liaising with the housing department to get accommodation. At the time he missed the meeting with his probation officer he had become overwhelmed with appointments. A man breached a court order on four occasions. Anthony Robinson, aged 28, who gave a care of address of Hockley Place, Grange Park, pleaded guilty to failing to comply with a community order. He was sentenced to do an extra 10 hours unpaid work for the community by magistrates. Cheryl Crawford, prosecuting for the probation service, said Robinson had been sentenced to a 12 months community order with 80 hours unpaid work for the community for an offence of driving while unfit through drugs. On February 21 and 28, he failed to attend to do the payback work. Robinson had breached the community order on three previous occasions. Steven Townley, defending, said at the time his client had been working extremely long hours in the building trade and also worked overnight in a nightclub on Fridays and Saturdays. He had emailed and texted his probation officer numerous times telling the officer of his work commitments. Robinson had now given up his jobs in order to complete the unpaid work for the community. A man behaved in an anti social manner annoying neighbours at 7am. Peter Wood, 39, of Palatine Road, Blackpool, pleaded guilty to threatening behaviour. 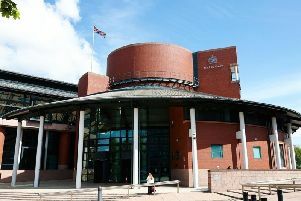 He was given a 12 months conditional discharge and ordered to pay £50 costs with £20 victims’ surcharge.Prosecutor, Carl Gaffney, said police went to Wood’s address on March 21, after getting a report the defendant and another man were throwing items from a window. Officers warned them to behave but later had to return to the address. Wood was behaving in an anti social manner, would not calm down and was arrested. Brett Chappell, defending, said his client had drug and drinks problems. He denied throwing anything out of the window but admitted arguing with police saying unsavoury things to officers. Since leaving prison in February Wood had worked at changing his life. He had got accommodation and was working with the probation service and substance abuse rehabilitation experts. A drink-driver on a mercy mission to rescue a woman friend crashed into a lamp post and knocked it down. Henry Bunker, a 26-year-old groundworker, of Ravenswood Avenue, South Shore, pleaded guilty to driving with excess alcohol. He was banned from the road for 14 months, fined £320 with £85 costs and ordered to pay £32 victims’ surcharge. Prosecutor, Carl Gaffney, said police were called to an accident on March 21, where Bunker had driven his Vauxhall Corsa into a lamp post on North Promenade. Paramedics were treating Bunker and his woman passenger at the scene. A breath test showed 46 microgrammes of alcohol in his body - 35 is the limit.Brett Chappell, defending, said his clientgot a call from a lifelong woman friend asking him to collect her.